Finding the correct answer to questions you may have about First Church can be time-consuming. Here are answers to some common questions. If your question is not answered here, you can search our website or call the church office at (512) 478-5684 for more information. Click on the question below to expand and view the answer. How can I join a Sunday School class? A: Adult Sunday School is a time-honored tradition at FUMC. Sunday School is the place where people learn about Christian faith in a loving, supportive environment. Our classes offer adults a wide selection of age groups, study topics, and learning styles. Most are a mixture of single and married people. All groups meet at 10:00 a.m. You are welcome to drop in a class on any given Sunday. To view a list of our Sunday School classes including descriptions and locations, visit fumcaustin.org/sundayschool. What programs do you offer for children/youth? A: A nursery with trained, paid childcare staff provides love and attention to infants through five years of age during worship on Sunday. Sunday School, led by volunteer church members, is offered to children beginning at age 3 years through 5th grade. Curriculum is selected to introduce age-appropriate Bible stories. Learn more at fumcaustin.org/children. FUMC’s youth program provides Sunday School, worship, programming, trips, retreats, fun nights, and Bible studies for youth grades 6-12. We seek to grow in love toward God and toward each other by cultivating a community of faith and friendship. Learn more at fumcaustin.org/youth. What do I need to do about childcare? A: On Sunday mornings, childcare is available for children through age 5 in Rooms 102-104 of the Education Building. For a detailed explanation of our ministries with children, see Children and Childcare. Except for Sunday morning needs, we ask that you contact our Director of Childcare, Pam Coronado at childcare@fumcaustin.org to make a reservation in advance so that we can plan for a healthy balance of children and caregivers. How can I have my child baptized? A: FUMC offers a Baptism class twice per year for parents who would like to have their infant or child welcomed into our congregation by this holy sacrament. Persons seeking Baptism for their children must attend a class, led by the Reverend Taylor Fuerst and Director of Children’s Ministries, Lara Greene in which the rich meaning of baptism is carefully explained–what God promises to us in this sacrament and what we promise to God. Families will also be able to connect with others in our church who have young children during this class. To register, indicate your interest on the Connections Card in worship or register at fumcaustin.org/baptismclass. For questions regarding children Baptism, contact Lara Greene at children@fumcaustin.org. If you are interested in adult baptism, contact Pastor Taylor directly at taylor@fumcaustin.org. A: Prior to joining the church, we ask all to participate in a First Steps class, to learn about Methodist beliefs and the ministry of FUMC, meet the pastors and other members, and ask questions. Sign up by emailing Trevor Harper at trevor@fumcaustin.org or registering online at fumcaustin.org/firststeps. How can I add my name to the mailing list or change my contact information? A: Our mailings are sent to one unified mailing list. To submit or correct your address and telephone number or to make certain you receive everything, please contact Marcia Houston at marcia@fumcaustin.org or 512-478-5684 (ext. 200). How do I communicate with the church? A: Our offices are open Monday through Wednesday, 9:00 a.m.-5:00 p.m., Thursday, 9:00 a.m.-3:00 p.m., and Sunday, 9:00 to 11:00 a.m. For other times, please call for an appointment. Should I call the church about pastoral concerns such as a birth, a death, someone in the hospital or other personal needs? A: YES. We want to know so we can respond as soon as possible. Call the church office at 512-478-5684 to speak with a pastor at any time. If you would like a visit from someone at the church, please contact Libby Sykora at ext. 203 or libby@fumcaustin.org. Prayer concerns may also be sent directly to Libby via email. 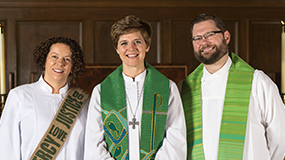 How can I have my wedding at FUMC? A: Wedding Ceremonies are temporarily discontinued in our facilities at FUMC. On September 24, 2017, members of FUMC adopted a resolution to discontinue marriage ceremonies by our pastors at our facilities in order to align our wedding policies with our strongly held principle of full inclusion of all persons. FUMC is active in efforts to bring change through the General Conference session in February 2019. Learn more at fumcaustin.org/worship-music/weddings. How do I publicize something within the church? A: To submit something for publication in church media, please send it to Tami Kellberg at tami@fumcaustin.org. To avoid delays, please fill out and include the Publicity Submission Form with all submissions. Submissions for the FUMC Weekly bulletin insert, FUMC eNews and website are due by 12:00 noon on Mondays. 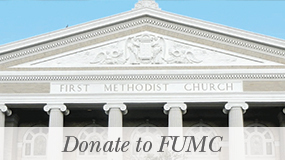 FUMC eNews is emailed on Thursday mornings. How do I get information concerning my pledge? A: Please contact Tom Mays, Business Administrator at tom@fumcaustin.org or at 512-478-5684, ext 205. If I lose something while at church, is there a Lost and Found? A: Lost and found items are kept at the front desk. How do I schedule a meeting room or an event at the church? A: Director of Scheduling Marilyn Good handles space reservations at marilyn@fumcaustin.org or 512-478-5684, ext. 204. Please make reservations in advance so that custodial support, heating and cooling, and other needs may be scheduled. Always indicate in advance if childcare will be needed. A meeting cannot be placed on the official church calendar without first scheduling with Marilyn. She will ask you to fill out the church Event/Project Sheet (PDF) as part of your planning. I am responsible for planning the programs for my group. Can someone help me with this? A: Certainly! There are many excellent resource materials and speakers available. Contact the church office at 512-478-5684 or contact@fumcaustin.org. It is best to plan well in advance, since some materials may need to be ordered and many speakers have full schedules.